Several things come to mind, but right now I’m thinking this is a rendition of a hippopotamus with an extraordinarily long tail. It should be wallowing around in mud! The selection of interesting parts isn’t as exciting or visually stimulating as with Chomly or Gobba, but we still receive a few treats. Take those 1×2 SNOT bricks in Medium Stone Grey, for example, the nine Dark Brown cheese slopes, or the two Black 1×2 slope plates. There’s a sole Dark Orange part in the shape of a 2×2 plate. Something to look forward to is how the build for Jawg starts out differently to the others; the base is built using two “offset” Dark Stone Grey plates that act as legs. Those parts remind me of the old Space sets (specifically thinking of Space Police). The lower half of Jawg’s particularly menacing mouth takes shape with the help of some 1×1 plates with clips, and of course those White horn parts I never have a use for. 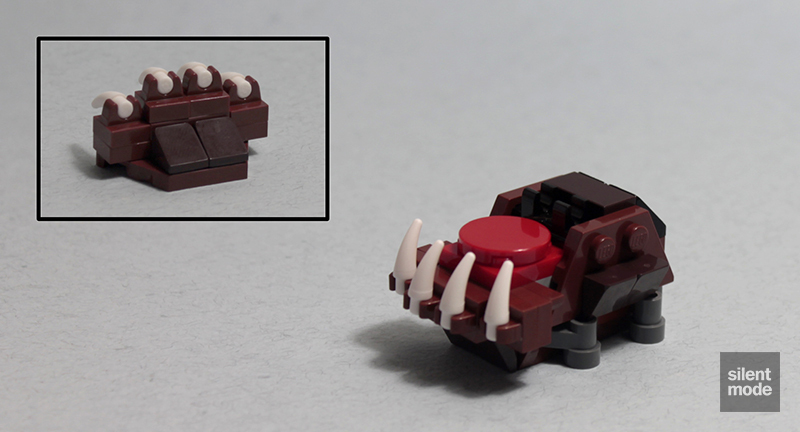 The 2×2 round Red tile that’s used for the tongue is the newer variety (with a stud holder in the centre bottom). Notice the SNOT technique used to give Jawg textured sides. The fiercely loyal and energetic leader of the Fang Gang, JAWG will stop at nothing to protect and help this quirky Mixel tribe. The Fang Gang live on a farm where they plant anything to try and grow more food to satisfy their massive appetites. 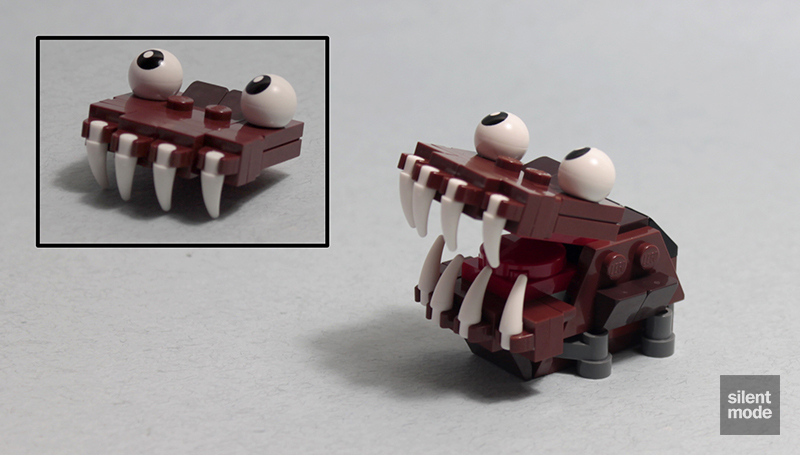 JAWG is a bit of an animal, and won’t hesitate to bite intruders with those incredibly huge, fang-like teeth. Beware of JAWG! Jawg is one of the more interesting Mixels to look at, and differs greatly from the others in that it’s a fairly intricate build. I actually prefer it without the Dark Brown slopes for feet. Apart from opening and closing its huge mouth, it has no play features whatsoever, so it’s definitely one of those models to go on a workplace desk, perhaps holding sticky notes or other handy items. 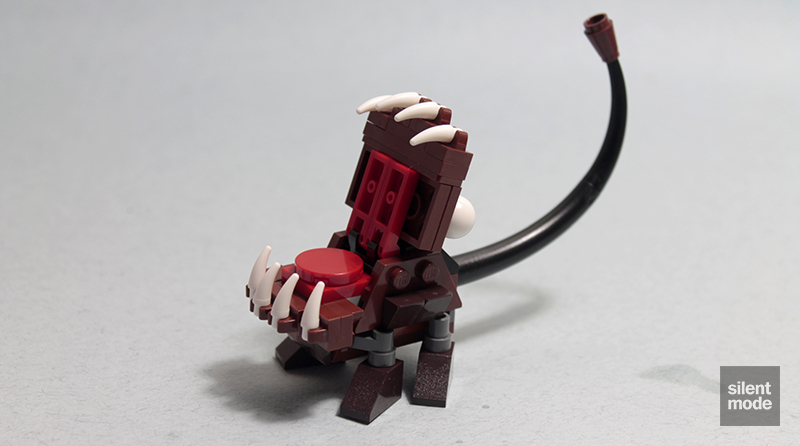 Maybe it can be caught trying to devour minidolls or minifigures? I’m giving this one 5.6/10, which concludes our visit to the Fang Gang. 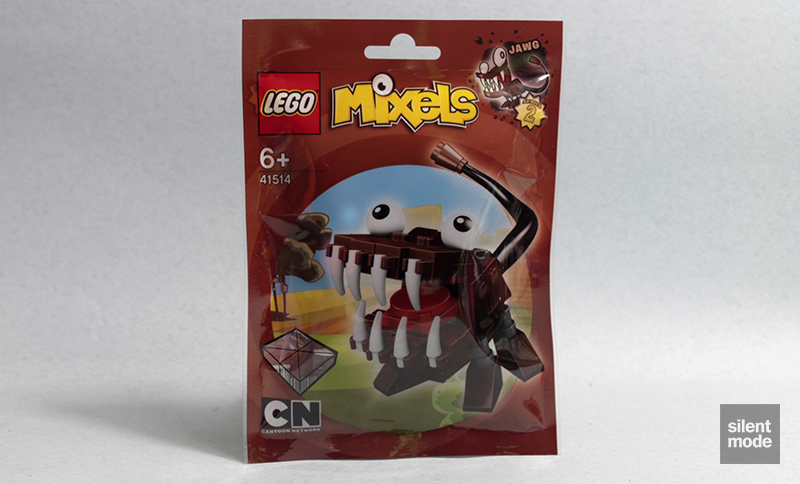 Join us next time for the remaining tribe in Mixels Series 2!